SHAH ALAM: M Kanagi begins her mornings with a prayer for her family as she has always done. But these days, she also prays for someone she knows only as the “Malay man”. Adi Kamal is that man, the Good Samaritan who features in her prayers. The story began when the couple’s young daughter, Sarmini, tapped on Adi’s car window and asked if her father could wash his car. While her father, S Sukumarah, was washing his car, Adi chatted with him and discovered he had suffered a run of bad luck and was washing cars to scrape a living and buy the books Sarmini needed for school. Adi posted about the family’s plight on Facebook and donations poured in. Now, nearly three months after his post went viral, the family’s life has changed more than they could have imagined. Sukumarah shows off his car-washing equipment, with which he intends to start a proper car-washing service. “I used to pray that my family would be free from struggles and always have good health. My prayers were answered in the form of the Malay man,” Kanagi told FMT recently. The rented family home in Padang Jawa is no longer as bare as it was. 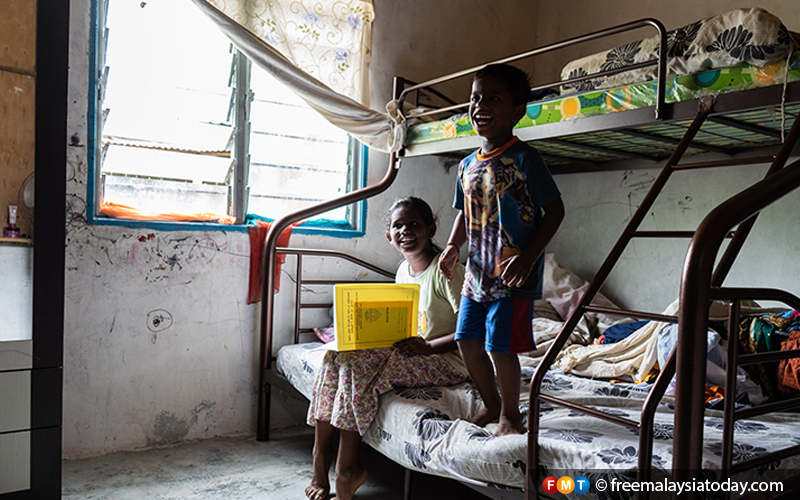 With the donations, Sukumarah has bought a bunk bed so that his family no longer needs to sleep on the floor. And they now have a fridge, so they no longer suffer from stomach bugs caused by spoiled food. 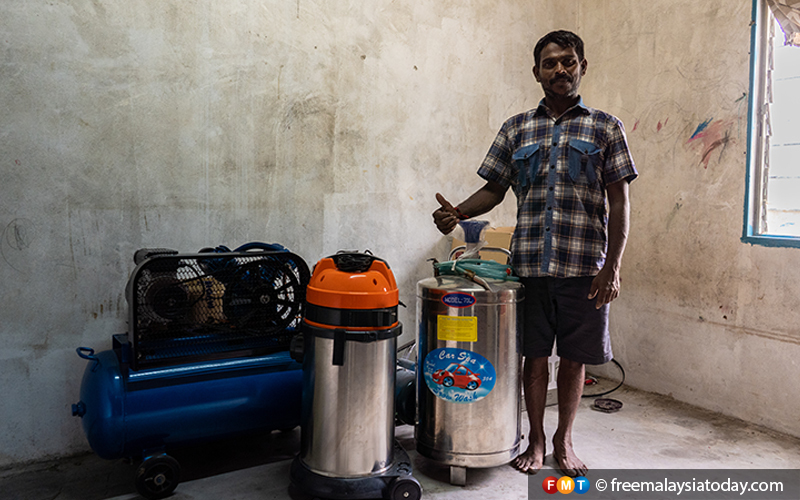 Perhaps most importantly for the family’s future, Sukumarah has been able to buy car-washing equipment and a second-hand van so that he can start a proper car-washing service. He said he never imagined he would receive so much support, not only in the form of donations from members of the public but also home visits from his beloved KFC and former prime minister Najib Razak. He admits to being overwhelmed. Sukumarah with his wife, M Kanagi, and their children Sarmini and Hariaran. Sarmini no longer has to tout for business for her father in the street but can fully concentrate on her studies. “Nowadays, I come home to study and help my mother with housework. We are even eating well now. Before, I had to share my food with my brother Hariaran. “I want to thank everyone who helped us. I am going to study well now as I am not always tired. In the future, I will be able to support my parents,” she said. Six-year-old Hariaran, who is much more talkative than when FMT first visited the family, is now going to pre-school for the first time in his life. He shows off what he’s learned there by reciting his ABCs and 123s in his favourite subject, Bahasa Malaysia. Sarmini and Hariaran are all smiles on their new bunk bed. Sukumarah and Kanagi, neither of whom had a proper education, hope to start their car wash business soon, but say they do not fully understand how to register the business with the Shah Alam City Council. Still, for Kanagi, who can now fully devote herself to caring for her family, bureaucratic hurdles are small challenges compared to what the family faced before when they were sleeping at bus stops. Among the family photos on the wall, Adi Kamal’s picture, clipped from a newspaper, has pride of place. “The only thing that saddens me is that even though we have received so much help and support because of the Malay man, we have not yet thanked him personally,” says Kanagi. FMT is now working on helping the family meet their Good Samaritan.